At HubSpot, our mission is to help organizations grow better. A key element in making this vision a reality is building a company as diverse as our customer base globally, and inclusive of individuals of all genders, ethnicities, ages, abilities, socioeconomic backgrounds, sexual orientation, and other forms of less visible diversity. 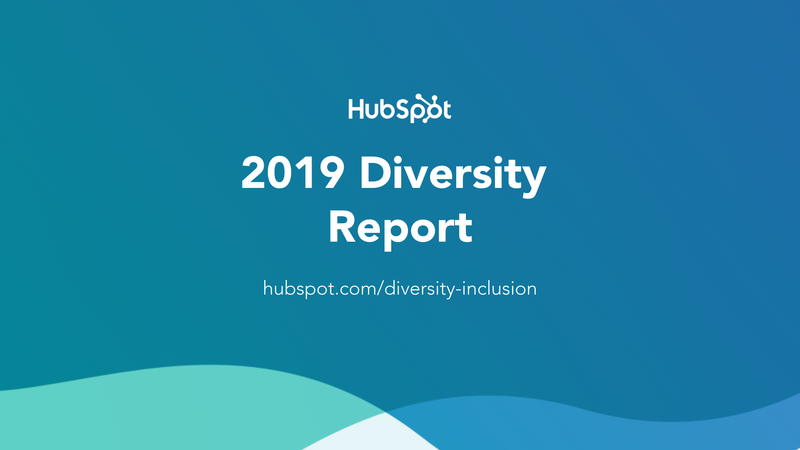 Today we published HubSpot’s 2019 Diversity Data Report, and this year, I’m proud to share that we did indeed grow better as an organization on our path to becoming more diverse and inclusive, increasing our ethnic diversity in the United States by 3.5% and continuing to increase our gender diversity, particularly in technical roles. 47% of our people managers are women, up from 25% in 2016. But as with everything we do, growing better means reflecting not just on what worked, but also on what didn’t. We’re committed to sharing our learnings, our failings, and our triumphs as we grow, with the goal of not only holding ourselves accountable to continuous improvement, but also giving our customers, partners, prospects, candidates, and employees transparency into how we’re working toward our mission of becoming a more diverse company. For the first half of this year, we talked a lot about diversity and made slight incremental progress. And it felt exactly that way internally — the progress was slow, and didn’t really move the needle on inclusivity in our organization. The initiative was easy to ignore when the business was busy, and while we had a cross-section of really passionate and resourceful individuals and teams who cared deeply about the issue, it was not pervasive in our operating system as an organization. Thankfully, some tough internal feedback directly from employees and leaders encouraged us to change course. In the second half of 2018, we put diversity and inclusion goals in HubSpot’s company strategy for the first time ever. This decision sparked the formation of cross-company and cross-team task forces (called a muscle group and accompanying action council) committed to focusing on this issue with an action-oriented approach. You can see the results of this priority shift in our 2018 data, with some meaningful improvement on gender and ethnicity diversity. But what the data really tells us is that we need to remain vigilant in making this a core part of our business, not just an HR or recruiting priority. In the first few years of diversity, inclusion, and belonging work, we did a lot of events and education to drive awareness and understanding of the topic and its relevance for teams. And while that work is certainly important, it’s not sufficient to drive meaningful and lasting change. So we started focusing on the systems and processes that drive our hiring processes as well as other elements of our business. We revisited everything from interview training to job descriptions to requirements for technical roles to adding even more rigor and wide-scale adoption to the Rooney Rule for manager and above positions, which had previously only applied to director and VP searches. We asked for input from our growth product team on our jobs page, partnered with our Business Enablement team to make preferred pronoun designation really easy within Slack and other internal systems, and reworked our new hire welcome and onboarding experience to reflect our commitment to diversity and inclusion. Beyond our candidate and employee experience, we’re also evaluating how inclusive our systems are for our community. HubSpot’s product experience and design teams are working on ability inclusion, and ensuring that our user experience research reflects the diversity of our customers. Our marketing team is committed to creating an INBOUND event experience that reflects the diversity of our global audience, and to making sure our executive content, sources cited, imagery, and editorial calendar are also reflective of our commitments on this issue. To truly permeate your business, diversity and inclusion needs to be baked into the daily activities of your global teams. I’m proud to say that we saw more teams than ever, both internally and externally, altering systems, tools, and processes to reflect our values of inclusion and belonging. The technology industry represents an interesting paradox on the issue of diversity and inclusion. On one hand, we operate in an industry where change is constant. On the other, the composition of teams and leaders in the world of tech over the past two decades hasn’t changed dramatically at all, so clearly there are some challenges our current industry approach simply won’t solve. The very nature of creating spaces where people feel they truly belong requires people and teams to always evolve, learn, and grow as human beings. To that end, we spent a lot of time as a team leaning into vulnerability, both individually and collectively. Many of our leaders published content internally and externally on their own experiences and fears in this space (including Dharmesh on being different and Frank Auger, our CIO, on being the executive sponsor of People of Color at HubSpot, and we spent much more time equipping our managers with basic tenets and activities to drive psychological safety within their teams. As it turns out, what most people expect of leaders as it relates to diversity, inclusion, and belonging work is not perfection; it’s a willingness to be more human. This year, we matched every employee resource group with two executive leaders so we had more champions in the room feeling personally accountable to inclusion objectives. We listened to hard feedback about where we were falling short and made meaningful and substantive changes based on that feedback. We created much more space for allies to be involved and engaged, celebrating Allies Week for the first time ever as a company. And in leaning into vulnerability, we leaned into what makes us each unique and distinctly human. We discovered that’s a great place to build commonality and connection, so it’s work we’ll continue to evolve in 2019. This year we really put a focus on ethnic diversity in our hiring process in the United States because we felt it was paramount in helping us become the company we want to be. But we are cognizant of the fact that it’s not enough to attract remarkable talent; we now have an obligation to ensure that, both as a company and at a team-level, we retain and grow that talent internally. Specifically, we know many companies in the tech industry have failed to retain members of underrepresented ethnic minorities (specifically folks who identify as African-American and LatinX), so we are going to spend a lot more time and energy as a business focused on investing in employees’ growth, personally and professionally. To make that happen, I’m proud to announce that Jabes Rojas has recently joined our team as the Director of Diversity, Inclusion, and Belonging in a newly created role. He’ll be managing three amazing people on our culture team who are already doing fantastic work in the DI&B space. In addition to adding Jabes to focus on all elements of our global diversity, inclusion, and belonging strategy, we’ll be leaning into our People of Color at HubSpot mentorship program, manager trainings, and our employee resource groups to help make inclusion and belonging part of our core value proposition as a business. HubSpot is a truly global company, with eight offices (our newest in Bogota, Colombia) and more than 56,500 customers and partners in more than one hundred countries. As a result, our strategy needs to encompass all the richness of experience that our global offices and customers possess. This year, I’m proud to share that our Dublin office was home to some really important parts of our diversity and inclusion work. We launched our first-ever Returners Programme created for professionals returning back to the workforce after a few years away. The goal is to support people who took time off to raise a family, recover from an illness, take a career break or whatever the case may be, and welcome them back into the workforce with an apprentice style program. We also participated in the 30% Club, which promotes board diversity and female mentorship in Ireland. While our global offices have been home to meaningful inspiration and innovation in the diversity and inclusion conversation, I think we can continue to evolve how our offices outside the United States contribute to our work With global support, we can be more aware of age, experience, gender, and socio-economic diversity along with region-specific diversity issues in each market. As we head into 2019, global thinking on diversity and inclusion will be part of Jabes’ core priorities and objectives, in partnership with the individuals on our cross-team leadership councils. This global focus makes it more important than ever that we think about diversity broadly, and inclusive of ability, age, sexual orientation, and socioeconomic status as part of our narrative and intentional work as we grow. You’ll note that while we made improvements at the HELM (HubSpot Executive Leadership team) level in terms of gender and ethnicity this year, we didn’t make as big of a dent as we would have liked to as a company in our manager, director, and VP numbers. And we still have to be mindful of gender in leadership roles as we think about our technical teams. Similarly, we have work to do in our G&A functions, core Services, and Marketing teams to create team-level diversity and inclusion we can all be proud of, but we saw significant increases in our Support, Product, and BET teams around ethnic diversity that is notable and encouraging. It would be easy in 2019 to just focus on our wins, but we are more committed than ever to partnering with teams where we still have room to grow to ensure they get the support, structure and feedback they need to continue to evolve and improve. One of the things I love most about working at HubSpot is that we are good at working together to hit a collective business goal. This year, when we as a business recognized that our progress wasn’t enough, we made a diligent and concerted effort to make diversity and inclusion a bigger part of our operating system. The results are starting to show, but we are far from done — we still have a lot of work to do to become a best place to work for everyone, and we look forward to building on and expanding our commitment on this path in 2019 and beyond. Learn more about HubSpot’s diversity, inclusion, and belonging initiatives here.